Italian brand with years of experience in the lighting industry. Provides lighting systems for television programs, architectural buildings and the Olympic Games in Atlanta, Beijing and Rio. Founded in 2001 by Marco Frascarolo with a desire to bring lighting professionals together in design, research, experimentation, training and culture. 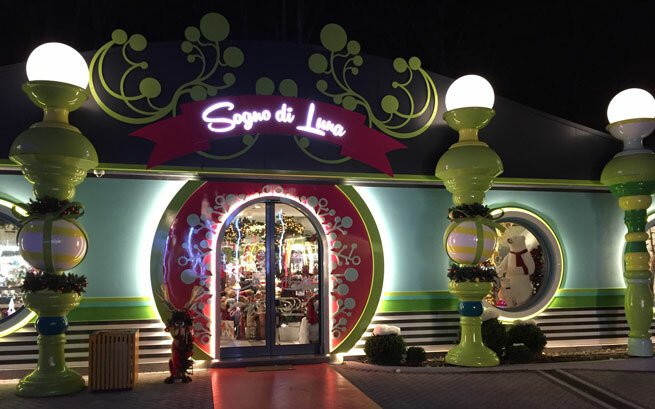 Luneur is the largest amusement park in Rome and the oldest in Italy dating back to 1953. Now the park has been completely renovated with new attractions and lighting after being closed for 8-years. The new lighting had to provide harmony between indoor and outdoor spaces, fit the characteristics of the park, have low energy consumption and highlight the vibrant colours of the buildings. In addition the visual impact of the luminaires on the surroundings had to be minimized. Using the latest LED technology and optical solutions, Marco Frascarolo and his Fabertechnica team together with Federico Ognibene of ILM Lighting, developed solutions that would meet all these requirements. Compact but powerful outdoor luminaires were made with LEDiL’s silicone optics with a stainless steel housing. Some optics were used to guide the light into optical fibers made from glass; this technique was used to create starry night scenes at the park entrance and the Trail of the Elves attraction. The decorative outdoor columns were lit using ZORYA silicone optics which provided a large amount of light on all directions and gave the sphere a uniform illumination. 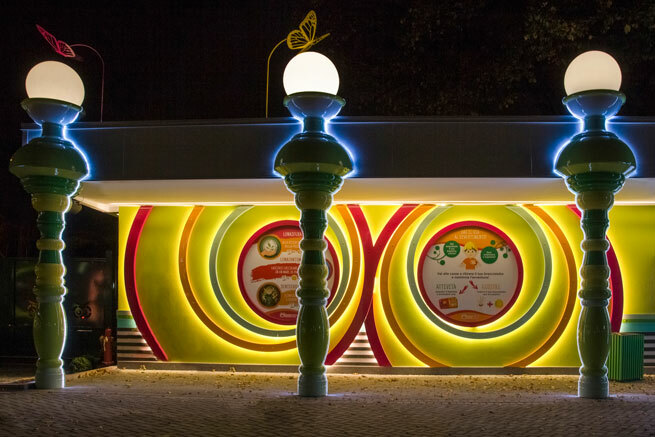 The Land of the Butterflies, a green space inside the park made to help children get familiar with nature, was illuminated with luminaires that had MIRELLA reflectors and were embedded in the ground. For the indoors ILM made surface-mountable luminaires that were capable of high luminous flux with LENA reflectors. These glare preventing luminaires were then also used in Lunatantum, a playground and a playroom fusion where small children can play together with their parents. With more than 1400 luminaires installed LunEur is an entertainment place and a delightful venue for both children and adults, locals and tourists. The fact that the whole 7 hectare park was completely renovated allowed the possibility to create lighting that was consistent both indoors and out. The clear colour reproduction of the LEDs ensured the vibrant colours of the buildings and attractions are seen at their best, while at the same time the maintenance costs were reduced significantly. From a safety point of view all the luminaires made by ILM can be used as emergency lights if needed.